It may be hard to imagine now, but there was a time when village life centered on the annual harvest. Everyone pitched in to till the fields and reap the bounty that nature provided. Without modern technology, it was back breaking work. This ritual is captured beautifully in “Collecting hay”. 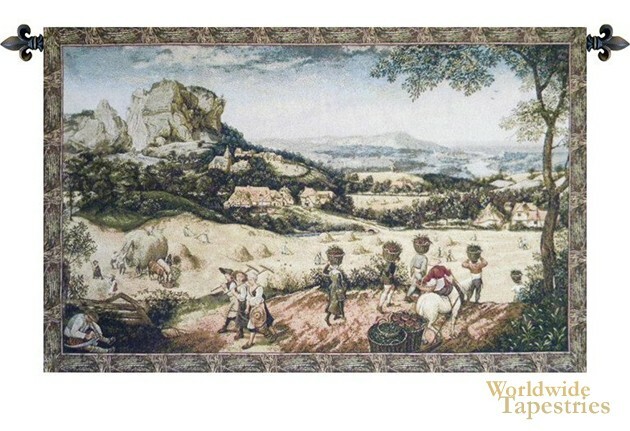 A reproduction of a 16th century painting, the villagers are portrayed working the land, and gathering the hay at harvest time. It is a beautifully pastoral scene, created with great attention to detail, right down to what the villagers were wearing. You can even see the types of homes they lived in, reproduced clearly in the center of the work. It is a wonderful insight into life in the 1500s. This tapestry is lined and has a tunnel for easy hanging. Note: tapestry rod and tassels, where pictured, are purchased separately.